Last week I had my first cover story in The Weekly Review. Exploring the idea of ‘daggy’ Melbourne, it’s a reflection on a few of the institutions and things that make this city different and personal for me. Nostalgia is seductive and I get that it can be dangerous – blinkering our view of the here and now, suppressing fresh thinking and new ideas – but I still have a fondness for many of the places mentioned in the story. I hope you do, too. Melbourne’s sophisticated laneways and arcades, with their beardy barista types and chic designer shops, are so cool they’ve become a key marketing strategy for the city. But there’s one arcade I bet you won’t find on the Visit Victoria website. It runs between Bourke Street Mall and Little Collins, at the Elizabeth Street end. It’s called ‘The Walk’ and, to put it politely, time seems to have passed The Walk by. With its low ceilings, clip-art-style logos and vinyl flooring it’s a hipster-free zone. There’s ladies’ fashion, a cafeteria-style breakfast/lunch spot called The Cultured Salad and a DVD clearance shop. A flat-screen tv blares free-to-air programs to passersby. But don’t get me wrong, I’m not here to sneer. I love The Walk. It represents another Melbourne to me: unpretentious, unselfconscious and uncomplicated. It’s daggy, sure, but refreshingly so. I’ve lived in this city all my life (I was born in the 1970s) but change happens incrementally. So, like the frog brought slowly to the boil, sometimes I feel like the scale of this change may be slipping me by, unnoticed. Gone, for example, is Hey Hey It’s Saturday (arguably a good thing), the Footscray Doughnut van (replaced, but not forgotten), Draculas (still alive on the Gold Coast, I hear), not to mention countless suburban milk bars. 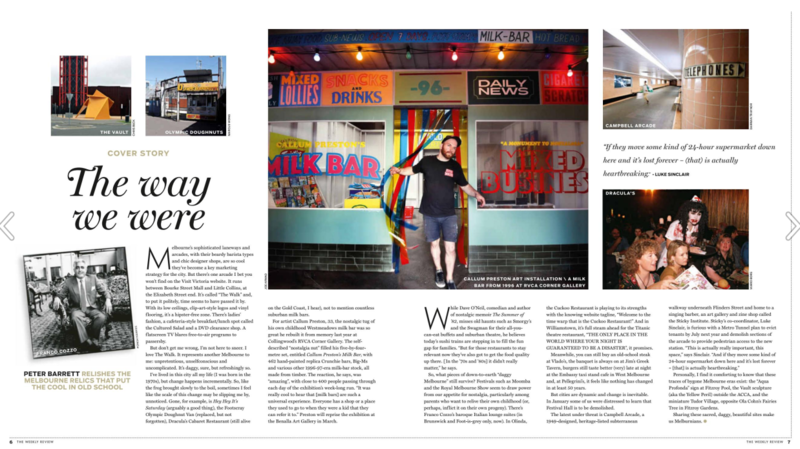 For artist Callum Preston, 33, the nostalgic tug of his own childhood Westmeadows milk bar was so great he rebuilt it from memory last year at Collingwood’s RVCA Corner Gallery. The self-described “nostalgia nut” filled his five-by-four-metre set, entitled Callum Preston’s MILK BAR, with 462 hand-painted replica Crunchie bars, Big-Ms and various other 1996/97-era milk bar stock, all made from timber. The reaction, he says, was “amazing”, with close to 400 people passing through each day of the exhibition’s week-long run. “It was really cool to hear that [milk bars] are such a universal experience. Everyone has a shop or a place they used to go to when they were a kid that they can refer it to.” Preston will reprise the exhibition at the Benalla Art Gallery in March. While Dave O’Neil, comedian and author of nostalgic memoir The Summer of ’82, misses old haunts such as Smorgy’s and The Swagman for their all-you-can-eat buffets and suburban theatre, he believes today’s sushi trains are stepping in to fill the fun gap for families. “But for those restaurants to stay relevant now they’ve also got to get the food quality up there. [In the 70s and 80s] it didn’t really matter,” he says. So, what pieces of down-to-earth “daggy Melbourne” still survive? Festivals such as Moomba and the Royal Melbourne Show seem to draw power from our appetite for nostalgia, particularly among parents who want to relive their own childhood (or, perhaps, inflict it on their own progeny). There’s Franco Cozzo’s baroque Italian lounge suites (in Brunswick and Foot-is-grey only, now). In Olinda, the Cuckoo Restaurant is playing to its strengths with the knowing website tagline “Welcome to the time warp that is the Cuckoo Restaurant!”. And in Williamstown, it’s full steam ahead for the Titanic theatre restaurant, “THE ONLY PLACE IN THE WORLD WHERE YOUR NIGHT IS GUARANTEED TO BE A DISASTER”, it promises. Meanwhile, you can still buy an old-school steak at Vlado’s, the banquet is always on at Jim’s Greek Tavern, burgers still taste better (very) late at night at the Embassy taxi stand Café in West Melbourne and, at Pellegrini’s, it feels like nothing has changed in at least 50 years. Personally, I find it comforting to know that these traces of bygone Melbourne eras still exist: the AQUA PROFONDA sign at Fitzroy Pool, the Vault sculpture (aka the Yellow Peril) outside ACCA, and the miniature Tudor Village, opposite Ola Cohn’s Fairies Tree in Fitzroy Gardens. Sharing these sacred, daggy, beautiful sites make us Melburnians. This story was first published in The Weekly Review on 28 February 2018.